CCM Premier Pro Leg Pads | Sports Etc. The new CCM Premier Pro has been redesigned with a foam core to improve the center of mass and to reduce the overall weight and feel of pad. These harder & lighter foams allow the pad to maintain it’s stiffness over time and helps the pad feel lighter as well. The pad’s strapping system is designed to both save weight and optimize performance. 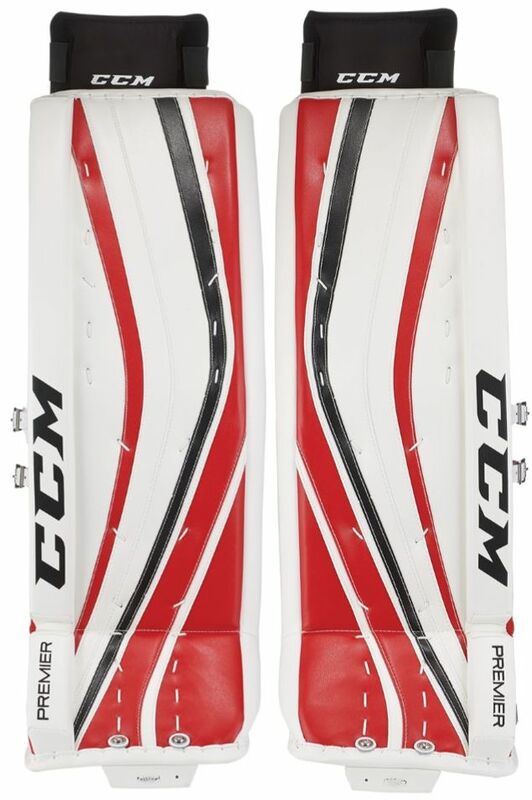 CCM removed the lower calf strap in favor of a four (4) inch wide single elastic strap over the calf lock, two straps at the upper calf, and a single elastic strap at the knee lock to help drive the Premier Pro downward with more power to seal the five hole more quickly and more easily. The Premier Pro comes standard with a solid outer roll and a pre-curved single break core. This is the first pad to introduce an injection molded foam core. Designed to maximize coverage and play big, the new exceptionally thin profile is lighter than its predecessor and provides a deep channel fit. To maximize performance and optimize leg rotation while in butterfly and reverse VH, CCM redesigned the pro leg strap set-up and made the padding in the leg channel lighter. Sports Etc Performance To Value Rating– 9 out of 10. A stiffer faced pad, which is great for any goalie looking to control and direct rebounds. No breaks in the pad also creates a perfect seal along the ice for your butterfly goaltender. Call 781-646-1600 or email us at info@sportsetc.net to speak to one of our custom gear experts.